Teddy Wilson bears the proud title of jazz musician pure and simple and that is why the music in this record is of such high standard. By the time he joined Benny Goodman (at age 23 in 1935) Wilson had mastered aesthetic perfection and has allowed pure music to speak for him ever since. ‘whatever elegance means, Teddy Wilson is it!’ these words by Benny Goodman and the Jazz text books that have typecast his individuality with words like ‘urbane’ ‘polished’, ‘poised’ or ‘impeccable’ designate his royal place in the hierarchy of great jazz pianists. Teddy Wilson’s originality has surmounted every trend, both as soloist and as a catalyst for all the greatest musicians of this era. Wilson is elegant, he is never bland. His subtlety never neglects intensity. And his sense of poise never interferes with his sound of surprise. 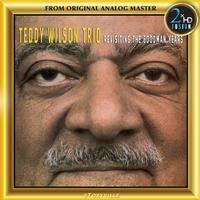 Teddy Wilson – like very few others in jazz – is most of all, a pure musician.